This card was originally published in an assorted stationery note-set as part of NobleWorks' non-humor brand, The Best Card Company and is part of a larger collection that spans a broad range of motifs, from traditional themes to contemporary graphics to vintage art ñ definitely something for everyone! 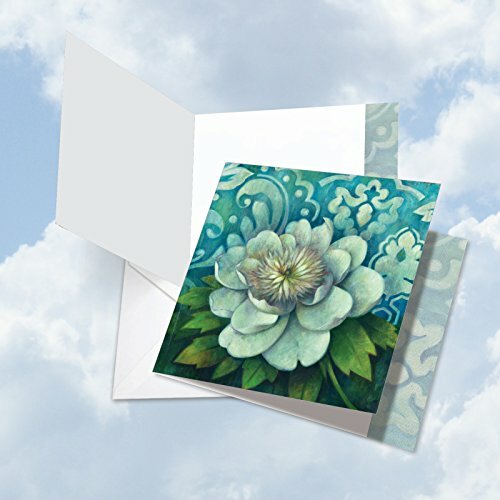 This card is printed on-demand in the USA on thick, bright, premium recycled paper. Many of the designs are available in both greeted and blank versions. NobleWorks is a relatively small, US based, family-owned company and has been publishing stationery products since 1980. Originally based in New York, NobleWorks now operates in New Jersey. We love what we do, and we publish our own original content in most cases combined with licensed contributions from a wonderfully creative community of artists, writers, illustrators and cartoonists; some have been collaborating with us for more than 30 years. Known for our funny cards and what has been described at times as snarky humor, most our revenue comes from our design based note cards and stationery products. We proudly print all our products in North America, mostly in NJ (of all places)! Every card is printed-to-order and on demand, which eliminates waste and obsolete inventory. No matter what the product is, we strive for 100% perfection and customer satisfaction ñ every card, every order, every time. We are here to serve whether you purchased our stationery directly from us or from authorized resellers."